Seona Sommer focuses on realistic portraits in oil, pastels, charcoal & chalk, as well as graphite. For her early works, she was mainly using her own reference photos that she took like a street photographer while traveling. She is now recruiting more and more models from her personal background both at home and her large online network. Even though she is exclusively concentrated on one the one figure on her canvas or paper while she is working, from a closer look at her complete works you can distinctly tell that Sommer's mission does not end with the plain completion of the portrait only. She wants to show the diversity of human beings by painting people from all kinds of social, ethnic, cultural, religious backgrounds, people of different ages, genders or with different sexual orientations, or people differing in any other more or less visible, real or made up, seemingly crucial ways. She also aims to include diverse emotional states of minds or atmospheres. You can find smiling and sad, black and white, young and old, rich and poor, familiar and unfamiliar, and many more people on Sommer's canvases or papers. All of them are members of the same human species, though. 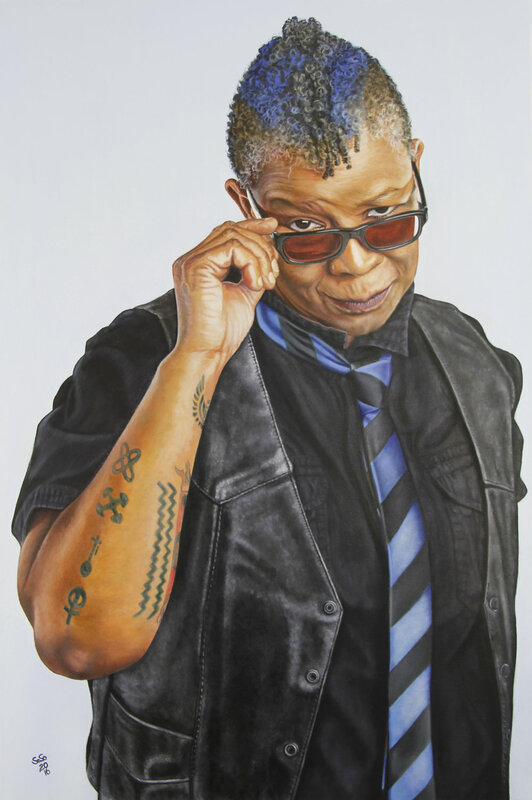 While continually striving to apply more and more hyperrealist techniques, the artist strives for an honest reflection of the portrayed figure and an open encounter with the viewer. Seona Sommer believes that personal meetings are essential for mutual understanding and peace. She wants to encourage others to have multiple encounters, then look for and recognize the common grounds we all stand on.